Clone Mark masquerades as Miles Vorkosigan (his progenitor) and dupes Miles' mercenary force, the Dendarii, into a mission to free clones held "prisoner" on Jackson's Whole, an anything-goes freebooters' planet where Mark was created and raised. When Miles finds out, he attempts to rescue his troops and his brother from the mess Mark has made, but is killed by a needle-grenade. He is frozen in a cryonic chamber on the spot, but the medic in charge becomes separated from the rest of the men while retreating under fire. The medic uses an automated shipping system to send the chamber to safety, but is killed before he can tell anyone its destination. The Dendarii take Mark to Miles' parents on Barrayar. Cordelia accepts him as another son and has him acknowledged legally as a member of the family. After a while, Mark concludes that Miles is still on Jackson's Whole, and decides to go there himself to look for him, since Barrayaran Imperial Security does not believe him. Cordelia helps by buying him a ship. Meanwhile, the frozen Miles has been resuscitated by the Duronas, a research group cloned from a medical genius, who are employed by Jackson's Whole magnate Baron Fell. His memory takes some time to return, and the doctors treating him do not know whether he is Mark, Miles or Admiral Naismith (Miles' cover identity with the Dendarii). Mark finds Miles, but is captured by Miles' old nemesis, Baron Ryoval, held prisoner, and tortured for five days. His personality fragments into four sub-personalities: Gorge the glutton, Grunt the sexual pervert, Howl the masochist, and Killer the assassin. Together, the first three protect the fragile Mark persona, while Killer bides his time. When Ryoval's assistant informs him that Mark seems to be enjoying the torture, a frustrated Ryoval decides to study his victim alone. Killer takes the opportunity to kill Ryoval, allowing Mark to escape. He sells Ryoval's secrets, accessible through a code ring, to Baron Fell for a large sum of money and permission for the Durona Group to emigrate. Miles' short death and revivification have serious repercussions for his health. Mark has his own problems, thanks to his strange upbringing, complicated by the torture. When he asks his mother for help, she sends him to Beta Colony for psychiatric treatment and therapy. 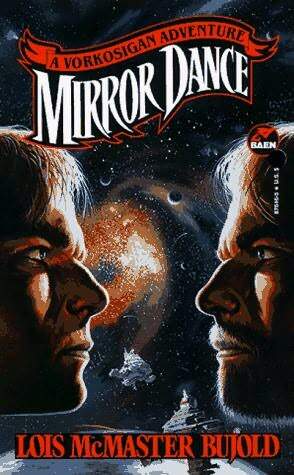 "Mirror Dance" ist die direkte Fortsetzung von "Brothers in Arms" und der zweite Teil der Mark/Miles-Romane, die die zweite Ära der Miles Naismith Vorkosigan-Romane einleiten. 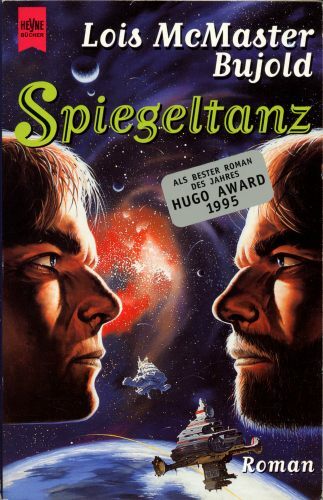 Er gewann 1995 den HUGO und den LOCUS - was zwar ganz nett ist, aber dem Buch nicht wirklich entspricht. Es ist ein Interludium zwischen zwei Erzählstilen innerhalb der Vorkosigan-Romane und inhaltlich deutlich weniger gut als einige nicht-bepreiste Geschichten desselben Zyklus. Das ist allerdings meine ganz persönliche Meinung, Jo Walton sieht das deutlich anders. Das heisst aber nicht, daß das Buch in irgendeiner Art und Weise schlecht ist, ich habe es zum x-ten Mal mit Begeisterung gelesen. Bemerkenswert fand ich den Kommentar von Lois McMaster Bujold zu Folterungen. Sie stellt Mark als schizophren dar, als aus insgesamt fünf Einzelpersonen bestehend. Vier davon erleiden (erdulden ? genießen ?) die Folterungen, während die fünfte, die eigentliche Mark-Vorkosigan-Persönlichkeit, davon gar nicht betroffen ist. Mir ist nicht klar (ich bin dafür zu einfach gestrickt), inwiefern dies auf die Realität anwendbar ist, ich fand aber diese Darstellung zumindestens bemerkenswert. Und nachdem ich hier so extrem geradeaus und auf Miles fixiert gelesen habe, machte ich bei dem Miles-Zyklus einen Schlenker und ging zurück in die Zeit zwischen "The Vor Game" und "Brothers in Arms". Und stellte fest, daß dort die beiden genialsten Romane des gesamten ersten Miles-Zyklus vorlagen.